This is Madison's room. It is the smallest room in the house other than the laundry room but it sure has alot of stuff.. Many pictures ahead (yeah).. I made this headboard out of fabric,stuffing,buttons,and a bit of ribbon.. Oh and my handy dandy staple gun! This dresser was from Jesse's nursery 18 years ago. 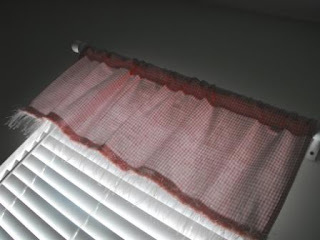 It came from Sears... add a little pink and some cutesie knobs... waaalaaa..
Walmart curtains... no problem... added some of the same trim. 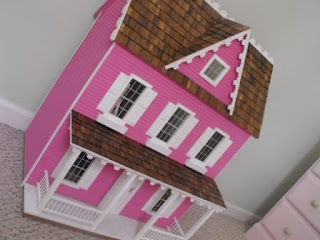 Remember that dollhouse.. So worth it, she loves it and plays with it everday. We saw this fan and had to have it... Flower power baby! Oh My Word! Her room is darling! Little girls' rooms are supposed to be filled with treasures to love and play with and her room certainly shows lots of things precious to her! I love all the personalized touches, everything is so sugar and spice! Your children are blessed to have you for their Mother, who cares to make their rooms unique and special for them. I've so enjoyed your home tour, it's inspired me to try to spruce up some of my own spaces. I definitely need help with my master bedroom so I can't wait to see yours! Major inspiration needed here. Thank you Susie for all the time you've put in on your tour, it's been worth it for us sneaky peeky bloggers who thrive off looking from the outside in, you're a total sweetie for sharing. Happy Morning! Madison's room is adorable! 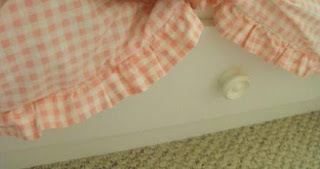 The drawers under her bed are a great idea! Love the tassel! All little girl! Precious and sweet. Lots of love packed into one small space! Her room is very sweet, I love that fringe you added and of course, the tassel. You are so talented, it's just perfect! I love all the special touches you've added in her room.. Abby will soon lose her crib and I look forward to re-doing her room...girls are such fun! Adorable! 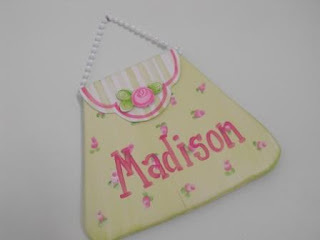 This makes me want a little girl so that I can paint some things pink! Love it!!! Especially those chandees! Too cute! Her room is adorable. Don't you just take such pride in those room where you have totally transformed everyday finds and put them together to make them look fabulous??? I think those rooms are the most special. My daughters like to mention to people who go into their room that "mommy made this, and she did this, and this." I think it is so special to them. I wish I was a little girl coming for a slumber party! What a beautiful room for a little girl. I love, love, love the ceiling tile idea! How precious! The dollhouse turned out great! I tried one of those kits years ago, but mine never saw completion! LOL! I love her room. 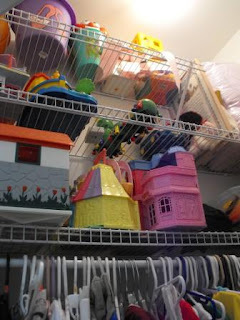 All those Polly Pockets remind me of Kayla's Little Pet Shop things. Everything is just so teeny tiny! When the girls get their new beds in, I plan on buying some cute containers to use as under the bed storage for all that little stuff! Can't wait to see where you take us next! Very sassy! 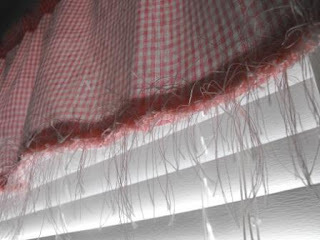 Love the fringe on the lamp and window valance. Pink is perfect for little girls. when my husband comes home from deployment i'm showing him your dollhouse! i want him to make one for our little one! Oh, wow, her room is so cute. I love all the M's above the bed. I have one of those girly girls who would love that room. I can't wait to see where we go next. I would love to have my own room there. Just darling is Madisons room. I love the trim on the curtains. What a sweet room!! Come by and see my attempt at tassel making. I hope I did you proud!! Hee, hee!! TWO darling girls rooms! How lucky are you! How lucky are they, to have a mom with such incredible taste! Oh wow! What a sweet room! Love the trims you added to the lamp and valance. 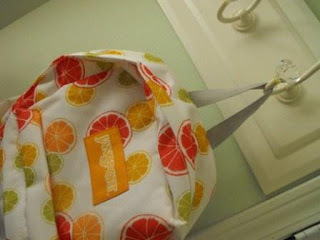 Love the tassle too! Well actually I love it all...hehe! Love the frills and fluff in here, of course!! Very cute and girly. Girly, girly! All pink and green it is wonderful! Looking forward to the next room. Your kids rooms are so NICE! I am totally being inspired by you, though. I *may* actually DO something with my sons room. :o) And finish what I started in my daughters room. MAYBE. Oh, I love your style. 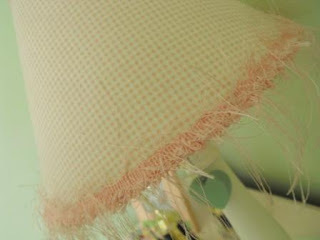 I love the trim on the lamp shade. I think I might try that on my dd to dress it up a bit. Morning Susie! 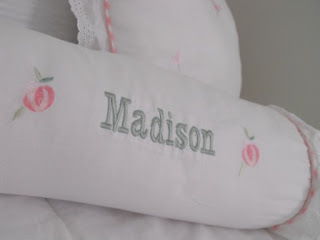 Oh, what a precious room for little Madison Grace - I just love her name! 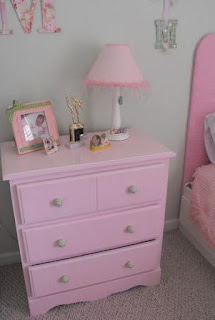 I love all the pinkness and sweet way you've put so much personality into her room. Now, that tassel, how perfect! You're a wonderful mother to make sure all your children's rooms are truly 'theirs'. I think my little tea pot tassel has some of that adorable trim on it. You are the bestest! too cute! Great minds think alike. I am working on a wall of H's for my family room wall. I loved the idea. I also did it for a client of mine. She loved it! 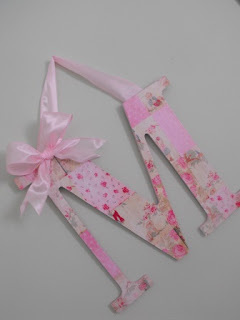 Where did you get the letter M with the pink bow that you covered with scrapbook paper. I love the style of the letter, it is one that I don't have! Can't wait to see what you show next. Love the Walmart curtains face-lift. I'm really enjoying your house tour! 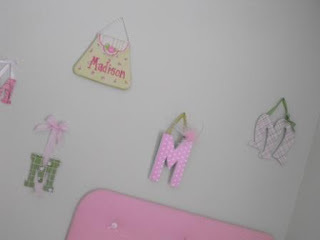 Her room is so adorable, I love all the monograms! SOOOOO Cute!!! I love it. I just love that color scheme.....it will never get old. Had to come by from vacation to visit.....I LOVE her room. It is so girly and cute..of course, we knew it would be!! You are a great inspiration for me because we are getting ready to re-do Lexi's room and you have such cute ideas. Thank you so much for showing them to us!!!! I'm so enjoying your home tour. What fun! I wasn't into dolls as a young girl, except for Barbie. I had tons of Barbie stuff too. If I had girls, I'd probably still want to play with her and all her friends. Oh, and that doll house. Wowsa, that's a beauty. WOW what a room!!! I try very hard to get my children's room's decorated. So far mydaughter's room is almost finished but her brothers just have a bed and dresser in their rooms. Wow! 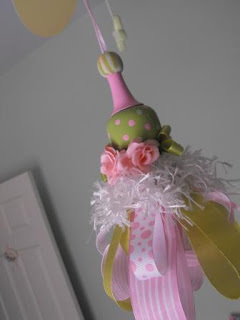 I love all the pink and that tassel is tres chic! But all those treasures under the bed, how fun. My little girl now has exercise videos under her bed! How I long for those days of Barbie's. Oh Susie you did such a beautiful job, I just love it. Oh Miz Susie, Which trim were you wanting? You know there is a 40% off coupon this week so you could use it on that if you couldn't wait for a sale. You just present the coupon at check out letting them know which item you're wanting the discount on before you are rung up. I didn't know if you knew you could use coupons on fabrics and trims...it's on one regularly priced item so if you got 1 yard or 15 yards of one trim that's still one item. But one yard of this and another yard of that would be two items, make sense? I'll keep an eye on trim sales for you too :) Which one is your favorite? I love the loopy ones in blues and brown, also the black frou frou gimp ones. I love the girls rooms-So beautiful. 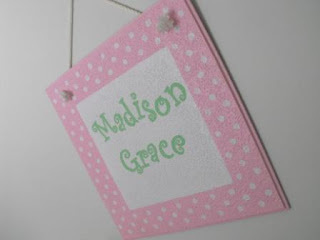 I love the name Madison Grace too. Your just a little Martha Stewart with the headboards and such. Very cute. Thanks for sharing...Love every bit of it! What a wonderful little girls room! Love all your room tours & your tassels! Every room is beautiful! 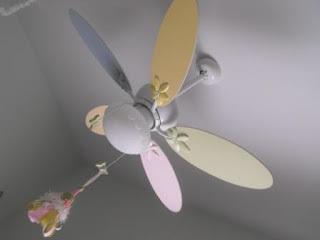 The tassel hanging from the fan is DIVINE! You're so talented Susie! Her pink letter M and oh my goodness that tassel!!! Those are my favorite things! 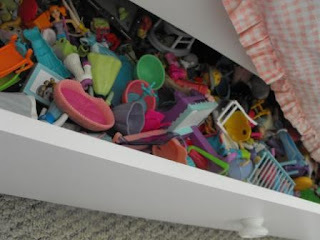 I was beginning to wonder where all her treasures were..under the bed. You sneaky thing you, what a great ideas!! u really do an amazing job. That doll house is amazing too. Wow! So cute! I LOVE it! That headboard is amazing! ANd those letters? The perfect touch! LOVE the tassel and all the "M's"!! 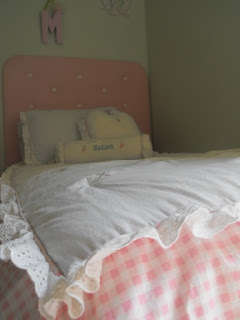 What a darling little girls room! 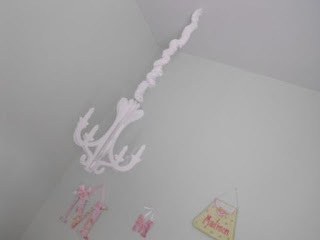 I had so much fun decorating my daughters room when she was little. That tassel is adorable! You made that headboard? You are so talented. I need a headboard! Do ya want to visit AZ anytime soon? I forgot to ask, can you point me in the right direction for the adorable doll house? Where did you get that? I know my daughter would love it too!! Very cute! I love the pictures. You've got a lot of talent. I actually want to know if you are the Susie Harris who lived in Chicago 30 years ago? If you are and we met at Sawyer Business College, please get back to me. It would be fun to talk again and catch up on things. If not, sorry to bother you.